Overall, vet visits are on the decline, a trend that probably follows the downturn in the economy since 2008. Apparently, though, it's cats who are being medically neglected more than dogs. According to Dr. Jeffrey Klausner, medical director of the Banfield Pet Hospitals who was interviewed by The Chicago Tribune, pet cats represented only 25 percent of the 2 million pets seen at Banfield Hospitals, even though people in the U.S. have 20 percent more cats than dogs. We have seen that people get fatter every year. Well, guess what? Overweight cats have increased by 90 percent during the past five years, and obesity in dogs has increased by 37 percent. Strangely though, the states with the fattest cats and dogs don't correspond with those that have the highest percentage of obese persons. 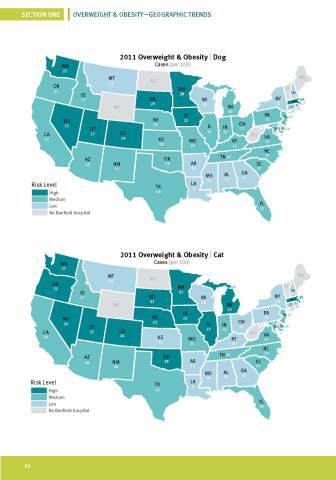 Obese pets live in Minnesota, South Dakota, Colorado, Utah, Nevada, and Washington; the states with the highest percentages of fat pets are Mississippi, Arkansas, Alabama, West Virginia, and Georgia. Corresponding to the increase in weight among dogs and cats, there has been a significant increase in arthritis and diabetes. 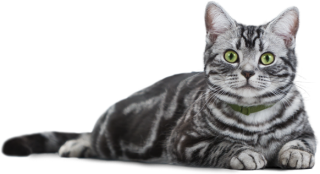 Among cats, hyperthyroidism has increased by 19 percent; hyperthyroid disease is coincidentally rising among humans as well. Most pet owners don't know their pets are considered 'overweight': © Banfield Pet HospitalBut the most common problem seen among dogs and cats was dental tartar. You folks just aren't brushing your pets teeth! More 'lightweight' statistics include the most common breeds of dogs seen and the most common cat and dog names. Overall, there are more mixed breed dogs seen than full-bred dogs. 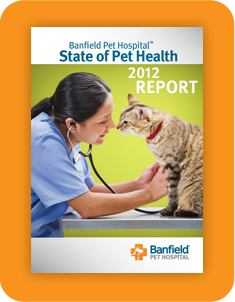 Dogs most often seen at the Banfield hospitals are those described as 'Pit Bulls.' The most common medium size dogs are Beagles and Boxers; German Shepards and Golden Retrievers are the most common breed dogs considered large. And then there are the giant dogs, the Great Dane and Great Pyrenees being the breeds most seen by the the Banfield vets. The most common dog and cat names? Max, Buddy, and Bella for dogs, and Tiger, Max, and Kitty for cats! Cat Guilt! The Animal Video Of The Day!! !